Be the first to share your favorite memory, photo or story of Eddy. This memorial page is dedicated for family, friends and future generations to celebrate the life of their loved one. 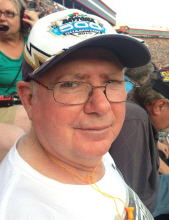 Eddy L. “Ike” McDowell, age 66, of Fredonia, passed away Saturday, February 2, at his home. He was a retired signalman with CSX Transportation. He was a member of Fredonia Cumberland Presbyterian Church and Brotherhood of Railroad Signalmen. Survivors include his wife, Tammy Sanderson McDowell, Fredonia, two sons, Jamie McDowell & wife, Alicia, Marion, KY and David McDowell, Fredonia, KY; one step son, Wesley Smock, Columbus, OH; one brother, Rick McDowell, Fredonia, KY, four grandchildren, Brynna McDowell, Dyllan Thornton, Ryan McDowell and Devin McDowell, three great grandchildren, Ryder Williams, Julius McDowell and Ryah Williams (due to arrive in June) and several nieces and nephews. He was preceded in death by his parents, Lilbert and Thelma Baldwin McDowell and two brothers, Don McDowell and Joe McDowell. Visitation will be Monday, February 4, from 4:00 pm to 8:00 pm at Lakeland Funeral Home and Cremation Services in Eddyville, KY. Funeral services will be at 1:00 pm on Tuesday, February 5, at the funeral home with Rev. Curtis Franklin officiating. Burial will follow in New Bethel Cemetery in Lyon County. Memorial contributions may be made to: American Cancer Society, c/o Anne Webber, 21 Dogwood Dr., Eddyville, KY 42038. "Email Address" would like to share the life celebration of Eddy "Ike" McDowell. Click on the "link" to go to share a favorite memory or leave a condolence message for the family.